Update: Sadly Dave Spragg passed away in 2016. He was an inspiration to all who met him. So after having a particular encouraging couple of months as mentioned in my last update a dark cloud began to form over my life in Nov 2014, namely my fiftieth birthday. Now normally I’m not one for parties but I decided that it was only fitting to have a small celebration to mark the fact I’d made a half century and more importantly it was a perfect opportunity to thank everyone of Team Spragg for their unending support over the last year in my fight against cancer. In the words of the the strap line for the new LHS/NHS partnership called Awyr Las (Blue Skies) ‘Always by your side’ I have been incredibly blessed with a group of people who have done exactly that and I thank them all. Couldn’t have got here without each and everyone of you. So the local British Legion was booked as were the caterers and I confirmed the services of Chris Summerill, big supporter of LHS and Ian Barnes from the band The Longsands. On the Saturday the doors opened and everyone piled in, given that I said a small gathering, over 100 people turned up. The evening went with a bang and Chris and Ian did a sterling job and entertaining us all evening. The evening was wrapped up by an impromptu performance of ‘One Guitar’ with Chris, Ian, Mike Peters and myself (not so good) but nevertheless another special moment of the year. Funnily enough when I sent the invites out I put a note on them saying that at fifty I had everything I needed and didn’t want any birthday presents, secretly I was just happy to be here a year after diagnosis and if people were happy and wanted to they could make donation to LHS on the night, expecting to get a bucket of change. 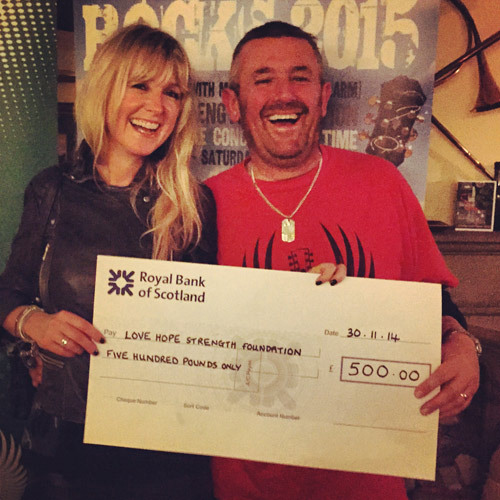 Well I’m pleased and humbled to say that we raised a staggering £500.00 for LHS. So thank you all for your generous contributions. I have now had a mind blowing 31 chemo cycles and I am pleased to announce that my CEA Blood count has continued to stay low and now floats around the thirties, it has risen a little from an all time low of 12 but it is still amazing given 6 months ago it was 1036, can’t quite accept it myself. I have another CT scan in early March to see how things are going. Generally I am in excellent health and the only real side effects from the chemo at the moment are a few skin complaints which are entirely expected and easily controlled. After my 12th cycle on this current regime my oncologists took me off of Irinotecan primarily to rest my bone marrow and allow it some time to build up its reserves again, so we will have to see in the coming months to see if that effects the overall positive effects of the chemo. When I write these updates it is always good to have some positive news so why should this one be any different. I am as you would expect, very pleased to say ( great British understatement) that after having had a scan literally just before Christmas and had the results only a week before Christmas Day, my tumours have shrunk a further 4cm which now means that in total my tumours have shrunk just short of by half the size from the increased size of late June 2014. And by the definition of the great British understatement, that’s pretty good isn’t it. I vividly remember this time last year as the Gathering approached the apprehension and fear that I felt having only been diagnosed a few months before, with no real understanding what the future held for me. However the overriding memory of that time a year later on was the fantastic experience of being called up on stage to play with Mike and the Band, I am still incredibly humbled by that and it gave me such a boost of positivity that helped me through the darker days of the early diagnosis and treatment. This year is an entirely different set of circumstances, I feel so much more in control of my illness. I am physically and mentally stronger, I have the positive benefits of some good results re tumour shrinkage and CEA blood count. So this year’s Gathering was even more special for me than last year (if possible), to be honest I wasn’t even sure if I would be able to go to the Gathering this time last year. But with the massive support of everyone in Team Spragg, some fantastic drugs and let’s not forget the brilliant Chemo Nurses At Macclesfield District and General Hospital I went there this year full of life and most definately feeling very much alive. I have crossed the proverbial road quite a few times this last year but have so far have not been hit by that oncoming bus and that’s the way I intend to keep it. And wasn’t G23 an amazing event, Mike, James, Smiley, Craig and Mark were on fire. It was most definitely a belter and I think one of the best yet, ah who am I kidding they’re all brilliant. When I was diagnosed in Oct 2013 I was told that there was less than a 1% chance of surgery and that my treatment would be purely palliative ie how long they could keep me alive. Well at my last scan my oncologist was so pleased at the success and shrinkage of my tumours that she actually said to me that she was writing to the Liver Surgeon to enquire as to the possibility of surgery, you could have knocked me down with a feather, what a difference a year makes. Christmas came and went and I forgot all about it, three weeks ago whilst in the car I received a call from the surgeons office basically saying that they are looking into the possibility of surgery, more knocking down with feathers. This was such a turn around of events it took time for it to settle in, they had requested a MRI scan to get a more detailed picture of my tumours before committing and stressed that until the results were seen it was not a given and it was no way a done deal and that it still might be the case that surgery was not possible, but still even to be talking about surgery, I cannot describe how positive that made me feel. On Tuesday 10th Feb I had said MRI scan at the MRI in Manchester all went well and I steadied myself for what would be one of the longest waits of my life for the results, expecting them tues 17th but no call, to say I was a little uptight that evening was again an understatement, then nothing yesterday morning, finally at three o’clock yesterday the call came through from the surgeons office. What came next is still sinking in and I haven’t quite got my head round it and it’s still sinking in but after 17 months of chemotherapy I am amazed and a little emotional to say that they have confirmed that they are prepared to operate on the liver to remove the disease. These are words I thought I would never hear in the same line as my name and I cannot begin to describe what the multitude of feelings are running through my head but the overriding joy to be now in this position and pure strength of belief feature very high I can tell you. There are a few more hoops to jump through, we have to get confirmation from the Bowel surgeon that he is also happy to operate on the bowel and if so I will have to come off Chemo for a few weeks to rest the Liver and get it stronger for surgery, then a consultation then it’s plan a date and ‘get it on’ as they say. To get this far and have this massive turn around in my fortunes is I believe in part is down to positivity something which I could not have achieved with out you lot out there and the support you have shown me along the way. I’m know we’re not out of the woods yet by any means so please don’t stop. I will endeavour to keep you updated as we go along but thankyou from the bottom of my heart for all your support so far. At the beginning of my journey Cancer had set it sights on trying to take me but I think after a long battle the tides may have begun to turn and for the first time I’m going after Cancer so look out. I don’t want to seem too cocky as the road to travel is still long and winding but I am allowing myself at least a small battle victory in the very very big war. So that’s it, life continues to move forward. 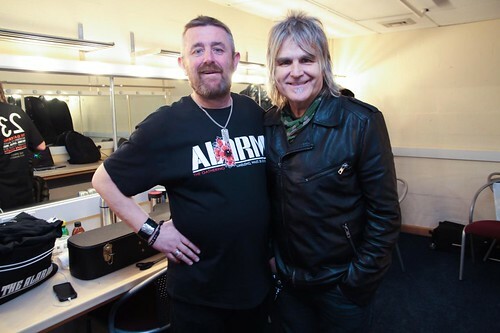 With this news I am so looking forward to getting out on the Strength Tour with Mike Peters starting in a few weeks and hopefully I’ll see some of you out on the road, but you never know I could just be in hospital recovering from surgery. Finally I hope that 2015 brings you the some of the positivity that I am feeling right now in whatever mad life changing experience you may experience. Remember the success of life is not crossing the road but stepping up onto the kerb safely on the other side.